Inkjet printers have a sloppy reputation for business printing. Run a highlighter pen over an important phrase of text and you're likely to end up with a smudgy mess. A few raindrops can make ink-printed envelopes almost unintelligible. Colour laser printers make a viable alternative but they tend to be big, heavy and expensive, so what's the answer? Epson bridges the gap between regular inkjet and laser printing with its resin-based DURABrite Ultra inks, which are practically dry by the time they hit the paper and are remarkably resistant to water, smudging and fading. As an all-in-one printer for the small or home office, the BX305FW has a wide range of business-like features. In standalone mode, it can handle mono or colour photocopying at the touch of a button but, unlike most multi-function printers, it adds faxing to its repertoire. Better still, scanning, photocopying and faxing all benefit from a 30-sheet ADF (Auto Document Feeder) to make light of multi-sheet documents. There's also a neat row of assignable speed-dial buttons for up to five phone numbers. 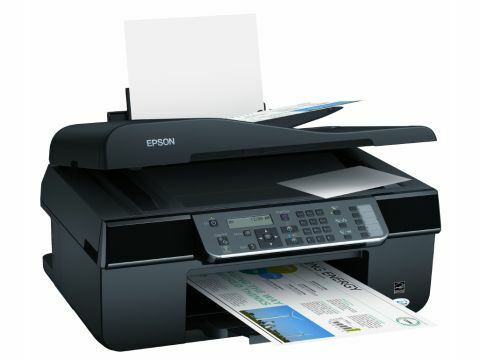 You don't need to be tied to the printer either, because the Epson is fully Wi-Fi certified in addition to carrying a standard USB 2.0 port. Another neat touch is that you can fire off faxes through the BX305FW direct from your computer, without having to print hard copies of your documents first. While the on-board control interface is fairly neat and tidy, using the Epson isn't all plain sailing. There's only a single, rear-mounted paper input tray, which sits vertically and can accommodate around 100 sheets of standard 80gsm paper. This means that if you want to print on headed paper or envelopes, you have to swap the paper around every time, and the same goes for photo printing. The dual paper input system on most Canon printers like the MG5150 makes life much easier. Another disappointment is that there's no USB port for direct document printing from flash drives, and there are no memory card readers either. An auto-duplex facility would have been nice too, since the instantly dry resin-based inks are perfect for double-sided printing, but sadly you have to turn each sheet over manually. Print speeds are a bit sluggish for document printing, taking 14 seconds for a mono text page and 58 seconds for a mixed text and colour graphics DTP page in our tests. On the plus side, the printer doesn't have to wait for pages to dry when outputting multi-sheet documents, which speeds things up in real terms. Photo printing is very slow, taking two minutes and 21 seconds for a 6 x 4-inch print in standard photo quality mode and over 12 minutes for an A4 photo print at the highest quality setting. As a four-ink printer, photo quality is compromised but even considering the lack of colour space, it's especially poor on glossy photo paper, although quite acceptable on plain paper. Running costs are steep when using the standard yield (Fox) cartridges that come with the printer, at around 3.7p per mono page and 14.5p for colour. Using high-yield (Apple) cartridges reduces this to 3.2p for mono and 10.3p for colour, but that's still pricey and the page yield is only about the same as you'd expect from Canon's regular cartridges fitted to the likes of the MP640 and MG5150.